Tenth Annual Picnic and Magical Get-Together, Ring No. 11, I.B.M. 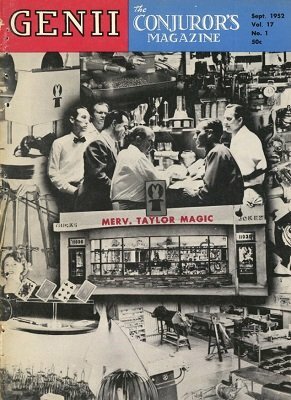 News of the Magic Dealers Association, Inc.
Arthur Andrews, Jr. & Harris Ruben - correspondence re: M.W.C.C. Programs for 10th Annual Convention - M.A.E.S. magazines - Magic-O, The Joker & M.W.C.C. P.C.A.M. Personality of the Month - Larry Keller, Vice-President P.C.A.M. A Visit With Joe Laurie, Jr. It's Just Plain Magic - Janet Leigh & Tony Curtis in "Houdini"
Louis Hornung and "The Magician"
Cover - Robert Youngs, President P.C.A.M. Francis Ireland to Lecture at P.C.A.M. Facing the Fact - obituary for William W. Larsen - Bill Larsen, Jr.
John Osborne - combine teen age magic clubs? Pacific Coast Association of Magicians, Inc.